Nexus 5 Price has been Confirmed- Stock Detailed In Taiwan. The Nexus 5 which will be reportedly released on the first of November, is going to be sold for around 2120 Yuan. 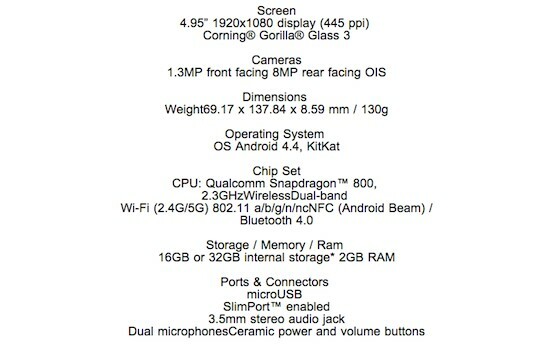 With the specification recently leaked, it looks like the Nexus 5 will sell well around the globe. The Nexus 5 pre-orders popped up on Ebay with some people asking a whooping $600 for the phone. 2120 Yuan translated to 349 dollars for the 16 GB version of Nexus 5. With the Latest snapdragon 800 SOC containing four Krait 400 cores and the beefy Adreno 330 GPU, the Nexus 5 reportedly equaled the iPhone 5s in the GFX benchmark in recent leaks. The battery which will be of 2300 mah is bringing in complains by former Nexus 4 users who complain of very less battery life. The 2300 mah battery is not a worthy improvement over the 2100 mah housed within the older nexus 4 considering the screen resolution is bumped from 720p to 1080p and the SOC also has been upgraded. LTE support has also been added which was sorely missed in the Nexus 4. A key feature of the upcoming Nexus flagship is the new version of Android, Android 4.4 kitkat will release with a lot of features. With some bug fixes here and there, it brings with it improved battery life, smoother transitions and enhanced security. U can download the Android 4.4 theme pack for your phones from here: Android 4.4 theme-pack. 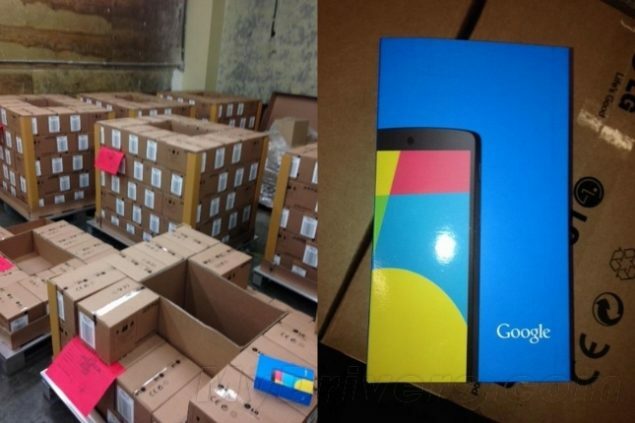 A consignment of 30000 units of Nexus 5 has been pictured. They will be sold by Canadian and US carriers. However 30000 seems like a very small number considering the competition, the Galaxy S4 sold 330000 in its first day and the iPhone 5 sold 5 million on its first week. We sincerely hope that Google keeps up with the pace of the demand and expands its operations into more countries.The Google play store is the only source of the subsidized Nexus 5. Much like the last Nexus phone, shortfalls are expected to plague the Nexus 5 also.